What role for Plantations in Climate Adaptation? This is a study tour with a difference. Gansu province in the north of China was an important stop on the ancient Silk Road – but life here is not silky smooth. The climate is harsh, and the desert encroaches on agricultural land at an increasing rate every year. Desert expansion, land infertility and lack of water threatens the living standards of communities in Gansu. 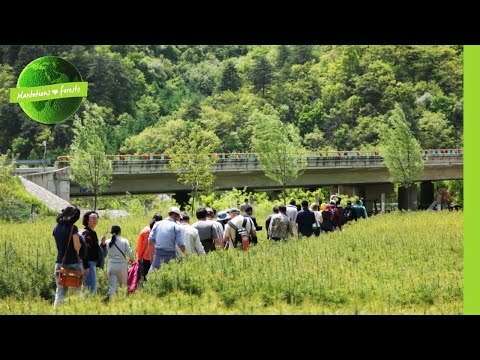 WWF’s New Generation Plantations (NGP) platform is organizing a study tour in Gansu during May 8-12 together with the China Green Carbon Foundation, Suzano and WWF-China. The NGP study tour aims to support these organizations in finding the tree species which both grow best in desert conditions and enable farmers to sustain their livelihoods. While few trees thrive in this harsh landscape, one species stands out. Yellowhorn (Xanthus sorbifolium) grows naturally in these desert climates, withstanding the sub-freezing winters and hot summers, and produces oil-rich seeds that can be used in food, cosmetics and as a biofuel. Could this be a potential solution for stabilizing soils, reversing the spread of the desert and providing livelihoods for local people in a water-stressed region? The Chinese State Forest Administration is supporting the planting of 940,000 hectares of yellowhorn trees across China. Suzano, an NGP participant, has established a 14-hectare research, development and seedling production centre for the species in Gansu, which will be one of the places visited by the tour participants. China Green Carbon Foundation (CGCF) is the first nation-wide non-profit public funding foundation dedicated to combating climate change by increasing carbon sink in China. CGCF was established in 2010, approved by the State Council, was registered at the Ministry of Civil Affairs and operated under the governance of the State Forestry Administration. CGCF provides a platform for enterprises and citizens to fulfill their social responsibility by storing carbon credits mainly through forestry measures. CGCF aims to strengthen public capacity of combating climate change, to support and perfect the forest ecology benefit compensation mechanism of China through conducting forest carbon sequestration projects and relative social activities. Gansu province is one of the regions set to benefit from the One Belt One Road initiative – a multi-trillion dollar development strategy proposed by the Chinese government, which aims to link Central Asia with the Middle East, Europe and beyond. NGP hopes the study tour will provide insights that can enhance the sustainability and resilience of this massive project. This daily blog is written by Barney Jeffries, a participant to the study tour. For many centuries, East and West were linked by the Silk Road. As trade flowed between Europe and Asia, so too did ideas and knowledge, fashions and food. It’s in the same spirit of cultural exchange that NGP has come to Gansu province in northern China, near the eastern end of those fabled trade routes. And our study tour kicks off by exploring the prospects for a Silk Road for the 21st century. In 2013, President Xi announced plans for a massive new development initiative – a “new Silk Road” linking China with the rest of Asia, Europe, the Middle East, North Africa and beyond. Known in English as One Belt One Road, it’s attracted billions of dollars in investment into infrastructure and development projects, including a trans-Asian railway and new road and energy networks across the ancient Silk Road countries of Central Asia. More than 60 countries, from Scandinavia to Australia, have signed up in a spirit of “peace and cooperation, openness and inclusiveness, mutual learning, and mutual benefit”. Along with this, President Xi has insisted OBOR should be green and development sustainable. The scale of the ambition is hard to comprehend. But an idea of how it can happen in practice can be seen right here, in Lanzhou New Zone – fated to become a “golden node” on the new Silk Road. Five years ago, the site of the vast, shiny conference centre where we’re meeting was barren desert. In 2012, the government approved the creation of a new city and free trade zone here – one of five across the country – to spur development in this arid and relatively remote region. The pace and scale of development are staggering. Hills were razed. Glacier melt from the mountains was diverted along an 80km canal to bring water to the new city. An airport was built, along with an expansive road network and a railway linking the New Zone with the old city of Langzhou, 60km away. Residential tower blocks and glass fronted offices seem to rise before our eyes. There are even giants replicas of the Acropolis and the Sphinx. By 2030, the city is expected to have a million inhabitants. It’s nothing like that now – many buildings stand empty and the five-lane highways are eerily quiet. But people are steadily moving in, along with an increasing number of businesses, including numerous Fortune 500 companies. But the most striking aspect of this new metropolis from our point of view is how green it is. Trees are everywhere: lining the pavements and the roadsides, clustered in the many parks and public spaces, around the shores of the artificial lakes. Poplars and willows, cypresses and firs, ornamentals bursting into blossom. What the Chinese call “ecological construction” has been built into the design of the city from the very start. While it’s early days, when the trees are fully established, they should make a huge difference to the health and wellbeing of the city’s inhabitants. But can this sort of approach be replicated? Can we really grow trees at scale in arid regions? How can we maximize the ecological, social and economic benefits? What sort of financial and policy support is needed? How can we create the “ecological infrastructure” that will underpin the developments along the new Silk Road? These are some of the questions we’ll be pondering over the next few days. Day 2 - Could yellowhorn bloom in the desert? Why grow trees in desert regions, where trees aren’t meant to grow? There’s a number of good reasons. Trees can help to stabilize soils and provide wind breaks, checking the spread of desertification and sandstorms. In 1978, China launched the “Three North Shelter Forest Programme” – also known as the Great Green Wall – in an attempt to stop the spread of the Gobi Desert. The biggest tree-planting project in the world, it’s expected to cover 350,000km2 by 2050. As well as protecting against desertification, it will sequester a vast amount of carbon in biomass and soils. But trees need continuous management if they’re to thrive in these harsh conditions – including plenty of water while they’re being established. Unless there’s an economic incentive for local people to look after them, then they’re entirely dependent on government subsidy. Over the last few years, increasing attention has been turning to one local species: yellowhorn (Xanthoceras sorbifolium) is native to the region, capable of withstanding the poor soils, harsh winters and hot, dry summers. But as well as being a promising choice for soil stabilization, and a beautiful sight when covered with white, yellow and red flowers, this small tree provides multiple other benefits. Its flowers and leaves can be used to make a tea with various purported health-giving properties. The leaves and the oil from its seeds are rich in nervonic acid, which can be used to fight dementia and Alzheimer’s disease – clinical tests are under way. The oil is richer in healthy unsaturated fats than olive oil or soy oil, making it an attractive edible oil. It can also be used in cosmetics, or even to make biodiesel. All told, yellowhorn offers huge ecological, social and economic potential. But while the Chinese State Forest Administration has big plans to support yellowhorn planting – it wants to see 900,000 hectares planted in Gansu alone – it’s still early days. One company that’s trying to kick-start things is FuturaGene, a subsidiary of NGP Participant Suzano and co-host of this study tour. This afternoon we visited their production facility on the outskirts of Lanzhou New Zone, which opened in November 2015. Traditionally, yellowhorn is grown from seed, and it takes over a year before a seedling is ready to be transplanted. In FuturaGene’s polythene greenhouses, seedlings grow to a height of 30cm, ready to transplant, in just 60 days, greatly speeding up the production process. Already this year, they’ve received more than 6 million orders – although they have the capacity to produce much more than this. But FuturaGene want to go further. Yellowhorn is an undomesticated species – unlike most orchard fruit trees or plantation species like eucalyptus and pine, which have undergone selective breeding to maximize desirable traits. At the moment, FuturaGene chooses the biggest seeds from trees with best flowers for ornamental use – but they’re doing more research into the best varieties to use. They’ve also just begun reproducing promising strains in their lab using tissue culture – that is, growing clones out of cell tissue. This is common practice for most plantation species, but is a real breakthrough for yellowhorn. While trees grown from seed will vary in quality and productivity, this system offers a guarantee of high-yield trees. It’s exciting stuff – I have visions of the endless barren hills of Gansu covered in flowering yellowhorn trees, providing biofuel for jet planes or a sustainable alternative to palm oil. But of course a note of caution should be sounded. Many “miracle plants” have failed to live up to expectations. While yellowhorn is drought resistant, if you want it to crop productively then it needs some irrigation, which could limit its expansion. And there’s a great deal of research, capacity builiding and investment needed. So how can yellowhorn live up to its undoubted promise? That’s one of the key questions we’re discussing this week. Halting desertification is only one of the reasons that China is planting trees. The rate of afforestation in the country over the last 40 years is nothing short of astonishing. In 1978, forest coverage amounted to 115 million hectares; by 2013, it had reached almost 208 million hectares – and the planting is still continuing. Along with sequestering carbon, improving air quality and increasing timber stock, one of the main drivers is preventing soil erosion. Many steep slopes have been planted with trees, whose roots help to hold the soil in place. They can also help retain water, while falling leaves and twigs enrich the soil with humus. We visit an example of a recent afforestation project near the city of Deng Xi – a historically poor area that’s benefited greatly from government poverty alleviation programmes since the 1980s. The 200-hectare site, on the hillside overlooking the city, has been planted with pines, spruces and cedars – each currently the size of a living-room Christmas Tree. It’s one of 29 sites being developed in the area. With all the trees planted by hand and connected to irrigation pipes, this work doesn’t come cheap –the estimated cost is RMB8-12 million (around US$1.5 million). The subsidy from the State Forest Administration covers about 40% of the cost, and the provincial government has set up an afforestation fund, with contributions from local government and private sector donors. The idea is that the plantation, when it matures, will be a site of recreation for local citizens – shrubs and flowers are to be planted too – as well as improving the local climate and air quality. It does seem worth asking, though, whether there are any ways to make the programme more economically sustainable – there are no plans to harvest timber at any stage. Right now, it’s hard to imagine a fully-fledged forest covering these brown, semi-arid hills. But as we drive further south, we see more and more hills planted with saplings. Some longer established ones really are starting to look green. And by the time we reach Xiao Longshan, we’re surrounded by mature mixed forest. We’ve now reached the endpoint of our journey, and the scenery couldn’t be more different. Here in the foothills of the Qinling Mountains, the watershed that separates the Yellow and Yangtze river basins, the landscape is rich and verdant. Rainfall here is much higher than in the north of the province, and the steep hills and deep valleys are covered with mixed coniferous and broad-leaved forest and vibrant undergrowth. But while this is a natural forest landscape, this isn’t exactly natural forest. By the 1970s, large areas had been cleared for agriculture or severely degraded. What we’re seeing now is the result of 40 years of restoration efforts – a process which is still evolving and raising new questions. Over the course of a busy day, we visit various sites, all different: plantations of introduced Japanese larch and native pines, a secondary forest with assisted regeneration of around 20 mainly broad-leaved species, an area where native ash is being grown for its high commercial and ecological value (it’s highly sought-after in furniture making, and aids water retention). We also visit one of the many nurseries, where pines and other species are crowded together waiting to be planted out into their final location. During the afternoon, we must pass literally millions of saplings – another reminder of the sheer scale of China afforestation/reforestation ambitions. The future purpose of these planted forests remains uncertain. In March this year, China announced a total ban on logging in its state-owned natural forests – which includes plantations of native species. For now, the official line is that each site we visit is being managed for ecological and biodiversity benefits – never for timber production. Other reasons behind the ban presumably include the need to build up its forest carbon stocks (as China has pledged to do under its climate commitments) and strategic timber reserves. While the country’s commitment to forest conservation is admirable, it’s questionable whether a logging ban is a helpful long-term solution. One of the big issues that NGP aims to address is the ever-growing demand for timber – not least in China, which still has a substantial timber deficit. Without making the most of plantations, natural forests elsewhere are likely to suffer from illegal and unsustainable logging. The landscape we’ve seen today would appear to be a healthy mosaic of productive conifer plantations, ideal for timber production, and restored mixed natural forest, suitable for sustainable selective logging of high-value hardwood species. Managed well, this could help meet timber demands while benefiting local people, without compromising biodiversity or ecological values. This study tour posed the question, “How can we realize the potential of plantations to contribute to land stabilization and community livelihoods in semi-arid areas?” Over the course of the week, we’ve been divided into five groups who’ve each looked at this overarching question through a different lens. So one group has been thinking about government policy, another about finance and investment, and another about the incentives such as carbon credits that could be available to local communities. One group has been considering the socio-economic angle, and another focusing on water and environmental issues. On our final morning, we all come together for the now traditional World Café. This is a chance for the groups to merge and mingle, moving between discussions as if circulating between tables at a cosmopolitan café (though tea house might be more appropriate in this instance). It’s a set-up that tends to provoke rich discussions, and this morning is no exception. There’s a lot of excitement about the possibilities we’ve seen on this trip. The potential of yellowhorn (and oil peony, which we’ve also seen in bloom – and tasted tea and liqueur from – on this visit) to provide both ecological benefits and sustainable livelihoods for local people in otherwise unproductive landscapes. The huge scale of tree planting taking place in this part of China. The world-changing vision of One Belt One Road – and the role that NGP can play in ensuring that there’s an ecological infrastructure underpinning it. Certain themes recur. There’s strong government support for afforestation in China – but consistent policies and coherence between different departments are important. And government subsidy alone can’t provide all the investment needed to develop sustainable plantations in semi-arid regions on a significant scale. From international development funds to private companies, green bonds and even crowdfunding, there are plenty of potential sources of finance – but the business case needs to be made to each of them. Understanding and mitigating the obvious risks of investing in a water-scarce environment is an important part of this. There’s a definite need for more research into potential water impacts and other ecological issues – and to be transparent about this, and adapt plans and decision-making according to the latest science. NGOs like WWF could have a role to play in this – as well as in the education, capacity building and stakeholder engagement that will be essential if local communities are to fully participate and benefit. Much more to talk about… We’ll be returning to these themes in follow-up publications – particularly NGP’s concept for a Green Belt Road. For now, it’s time to say a huge thank-you to everyone who made this study tour possible – and particularly to our hosts from the China Green Carbon Foundation, WWF-China and FuturaGene for their warmth and hospitality. It’s been a great pleasure to come to Gansu: I hope we’ll return soon.